On January 27, news broke that the president of the United States, Donald J. Trump, had signed an executive order barring citizens from Iraq, Iran, Syria, Yemen, Sudan, Libya, and Somalia from entering the United States for 90 days. The very next day, immigration officials started detaining and, in some cases, deporting, those arriving from these seven countries; crowds gathered outside US airports in protest, and the ACLU, along with several other groups, filed a legal challenge. People on social media pointed out that Trump had issued the anti-refugee and anti-Muslim executive order on the International Holocaust Remembrance Day. Under the hashtag, #HolocaustMemorialDay, people shared images of Jewish families and children who had arrived to the United States on the St. Louis in 1939, only to be turned away and to later perish in European concentration camps. The parallel between refusing Jewish refugees escaping persecution then, and refusing Muslim refugees escaping war and persecution now, is remarkable. Yet, one can go back even further in history to find prior connections with the events that have recently unfolded: February 5, 2017 marks the 100th anniversary of the passage of the Immigration Act of 1917—an Act, which for over three decades after its passage, along with existing immigration laws and agreements, prohibited immigrants from almost the entire Asian continent from entering the United States. 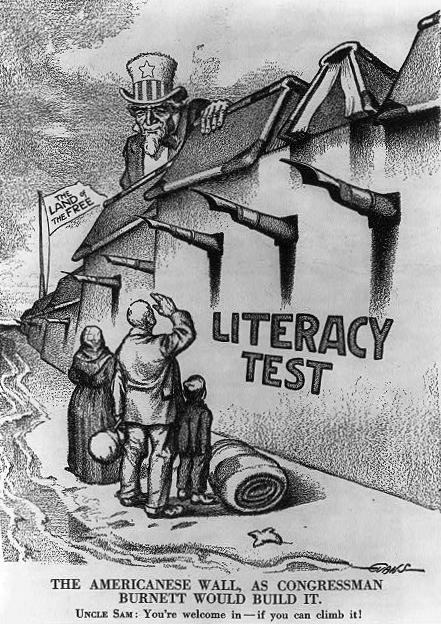 Passed over a presidential veto, the Immigration Act of 1917 marked the epitome of anti-immigrant sentiment in a nation that was then gripped with the hysteria of “100% Americanism” in the midst of World War 1. Enabled by fears of economic competition, anti-Asian sentiment led to widespread support of the Act’s xenophobic exclusions. Various labor organizations, including the American Federation of Labor, supported the passage of the Immigration Act of 1917. The barred zone, thus, covered those geographical areas from which immigration was seen as particularly threatening, both racially and economically. The racism and xenophobia that triggered the exclusion of Chinese and Japanese immigrants from the United States is well documented. Starting in the early 20th century, exclusionists on the West Coast were also raising voices against the arrival of immigrants from the South Asian subcontinent. 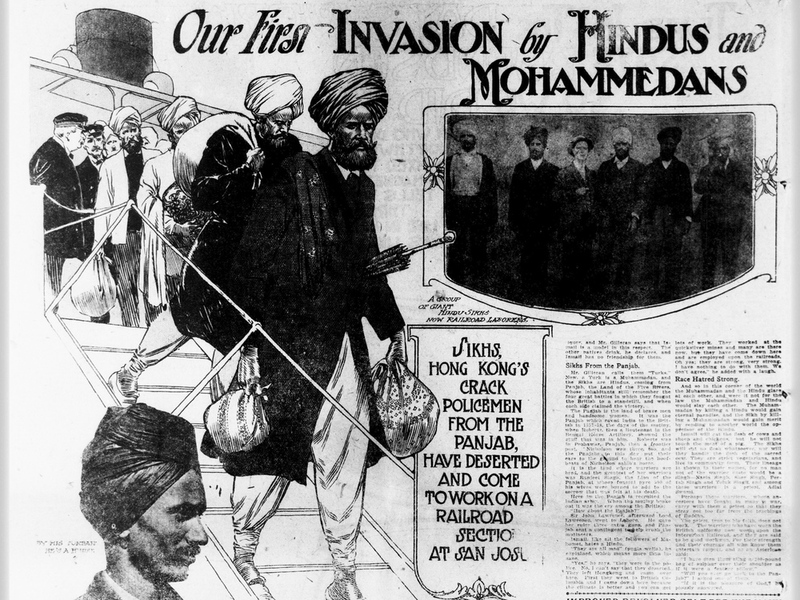 They argued that the new migrants, whom they labeled “Hindus” or “Hindoos” (despite the fact that a majority of the incoming migrants were Sikhs or Muslims), were the newest incarnation of the ongoing Asian “problem” that faced the United States. At the time of the creation of the barred zone then, Congress was more concerned about “The Tide of Turbans,” and “yellow peril” with origins in China, Japan, and India, than it was in immigration from the Middle East. 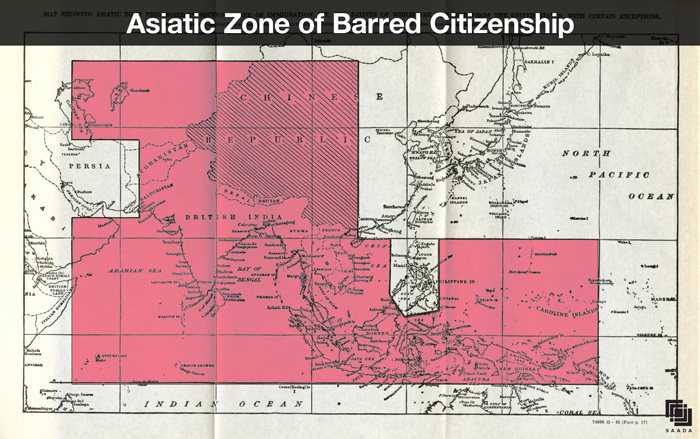 As Gualtieri writes, “The erection of the Asiatic barred zone marks an important moment of differentiation between Europe’s Asia—which included India and West Asia—and America’s Asia, in which India occupied a liminal space and West Asia (the ‘Middle East’) was absent.” (77) Today, the source of anti-immigrant angst has shifted: from “Orientals” and “Hindoos” to Muslims and “radical Islamic terrorists.” The Asiatic barred zone created in 1917 remained in effect, in one form or another, until the passage of several acts that acknowledged and overturned the racial exclusions it promoted: the repeal of the Chinese Exclusion Act in 1943, the Luce-Celler Act of 1946, which allowed the entry and naturalization of immigrants from India, and the 1952 McCarran Walter Act, which abolished all racial restrictions on immigration in favor of a quota and preference system. The 2017 ban returns us to an exclusion era these acts sought to put to an end; so far, the ban is for 90 days, but it is possible that it will be extended in duration and expanded to other countries. In their introduction to a special issue of the Journal of Asian American Studies on Arab American Studies, Sunaina Maira and Magid Shihade argue that scholars of Asian American Studies should expand “our frame of analysis to consider the ways in which categories of subjects such as ‘Asian American’ and ‘Arab American’ are positioned in relation to US empire.” As we see reflections of 1917 in 2017, and understand how anti-immigrant sentiment and Islamophobia in the United States have precursors in the anti-Asian immigrant movements of the late-19th and early-mid 20th centuries, the task of forging connections between Asian American and Arab American studies becomes more important than ever. 1. The Immigration Act of 1917 exempted “government officers, ministers or religious teachers, missionaries, lawyers, physicians, chemists, civil engineers, teachers, students, authors, artists, merchants, and travelers for curiosities or pleasure,” and their “legal wives or their children under sixteen years of age” from the barred zone restrictions. Individuals allowed entry under these provisions, however, had to maintain their “status or occupation” while in the United States or be subject to deportation. Kritika Agarwal is associate editor, publications, at the American Historical Association.